Circuit: CMOS INVERTER PARALLEL LC OSCILLATOR __ Circuit designed by David A. Johnson, P.E. 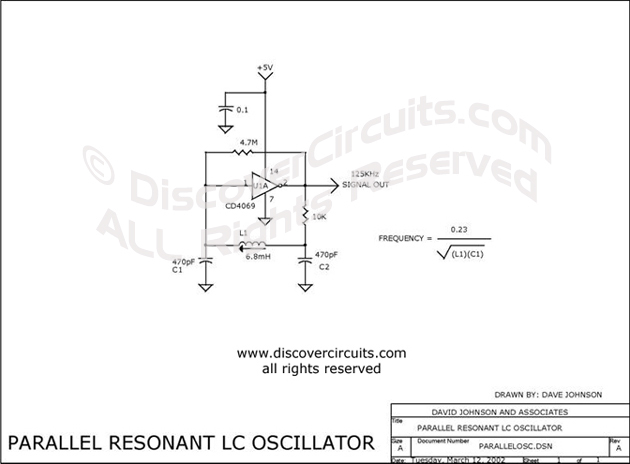 I have used this parallel resonant LC oscillator circuit countless times. The oscillator frequency is determined by the inductor and capacitor values. I have shown an adjustable inductor to make it easy to set the frequency to a specific value. Once set the frequency is fairly stable over supply voltage variations and temperature changes. The values shown are for 125KHz but the frequency can range from tens of kilohertz to tens of megahertz. With a 74HCU04 type inverter, it will oscillate down to about 1.5 volts. If the frequency is low, you can also use a 74C04 (CD4069) inverter.